When we think of gritty power forwards, some of the big names that come to mind are Mike Richards, Brenden Morrow and Milan Lucic, just to name a few. Although he has had many successful seasons with San Jose, this season 28-year-old Ryane Clowe is making a bigger case than ever to earn himself a grouping with the other elite power forwards from around the league. Clowe, a native of Fermeuse, Newfoundland, scored two goals this past Wednesday night (one being the tying goal that would bring the game into overtime) against the Vancouver Canucks in what may have been the best game of the season. The pair tallied last night gave him a total of 21 goals, 31 assists and 52 points in 64 games, while also racking up 84 penalty minutes and 10 fighting majors (just one fight behind team-leader Jamal Mayers). Last season, Clowe was also second on the San Jose Sharks with 11 fighting majors in the regular season, and whopping 131 penalty minutes to go along with his consistent offensive contribution of 57 points. His solid all around play earned him an assistant captain title with the Sharks this season, which started off as being just a road assistant, splitting the duties with Patrick Marleau, but recently both players have been given the permanent “A”. Even with Clowe putting up solid numbers and being arguably one of the best players on the San Jose roster this season, he still hasn’t received that much media attention or recognition for his above-average play night in and night out. For those who don’t follow the Sharks, Clowe might just be one of those quiet contributors you see in the middle of the points list, but I assure you his value and impact goes far beyond the 50 some-odd points he has chipped in the past three seasons. Being from the East Coast of Canada, Clowe played the first three seasons of his major junior career with the Rimouski Oceanic – that’s right, the same team that harvested the likes of Sidney Crosby. His best season with Rimouski read 73 points and 120 penalty minutes, while also having an equally successful over-aged season which he split with Rimouski and Montreal Rocket in 2002-03. From there, Clowe played two-and-a-half seasons with the Cleveland Barons of the American Hockey League, before playing his first NHL season with San Jose in 2006-07, where he potted 16 goals, 18 assists and 78 penalty minutes in 58 games. Since then, Clowe has been a major part of San Jose’s regular season success of the past few seasons, and has always been a consistant contributor for the club in the playoffs. In 308 regular season NHL games, Clowe has scored 81 goals, 124 assists, 205 points and 375 penalty minutes – pretty good for a sixth round pick (175th overall). Coupled with adding consistant secondary scoring, grit and sandpaper to the Sharks line-up, Clowe is also known for his incredible playmaking abilities that mimic that of fellow teammate, Joe Thornton. Although Clowe doesn’t pick up nearly as many points as Thornton does, his ability to cycle the puck along the boards, work in the danger-areas and set up plays from behind the net is similar, and like his captain, his size and willingness to stick up for teammates is something he takes pride in. The six-foot-two, 225-pounder will rarely loose a puck battle along the boards, and his skating ability (for his size) allows him to backcheck well and play a solid two-way game. Clowe is also known for his soft hands, which is why the Sharks almost always use Clowe in the shootout as he has a patented fake-to-backhand move that rarely fails. His ability to score goals from the top of the circle and high-slot by using his wicked wrist shot is something that not every player of his calibre has. It’s guys like Clowe that force one to open their eyes at the skill level of not just the superstar point-getters in the NHL, but the classy, impact players that never take a shift off and will do anything for their teammates. 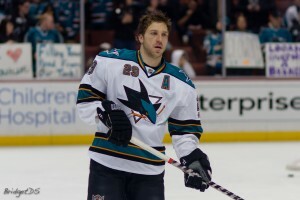 Look for Clowe to continue leading the Sharks through the remainder of the regular season and into the playoffs.